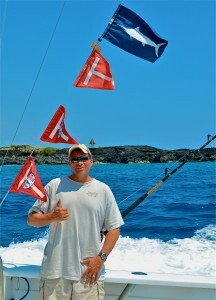 We are located in Kailua-Kona on the Big Island of Hawaii. All three boats are located in Honokohau Harbor. Which is 4 miles South of the airport and 2 miles North of Kailua-Kona. As you approach the harbor, you will come to a stoplight then you will see a big sign with a marlin on it that says “Honokohau Harbor.” Once you turn toward the harbor you will be on Kealakehe Pkwy. We usually fish 3-5 miles off shore on an average however; we may go further off shore to the FAD’s (buoys) or find the Porpoise Schools that are holding fish. Do we need a fish license? If your prone to motion sickness you can take Dramamine or Bonine. You can take one the night before when you go to bed and once again in the morning when you wake up. If you do get sick once you’re on the water the best cure is to lie down and fall asleep. Once you wake up you will most likely feel better however, if you don’t feel better we can always take you in. We will not keep you out on the water if you do not feel good. On the “Hooked Up” and “Go Get Em” you bring what you want to eat, drink, sunblock and camera. On the “EZ Pickens” lunch and drinks are included. Please use “lotion” sunblock; we discourage any type of sunblock “spray”… especially on “EZ Pickens”. Most of the time shorts and t-shirts are fine. Also, bring sunglasses and hat to help protect you from the sun. The average temperature in Hawaii is 80 degrees year round. In Kona you are fishing for all the Pelagic Fish: Blue Marlin, Stripe Marlin, Spearfish, Mahi Mahi, Ono and Ahi Tuna year round. We use a variety of lures that we troll at 8 knots to catch all these fish or we use live bait. How long does it take to catch a marlin? The average size marlin is around 150 pounds and usually takes 10-20 minutes. There have been some fights that last over 8 hours or long into the night and they end up weighing over 1,000 pounds. Best to try and catch them quick so when you release them they have the best chance of survival. Do you release the marlin or keep them? We like to try and release all the Blue Marlin and other billfish but if they come up dead or really injured and will not survive then we will keep them. All the marlin we take will be used and not wasted. Most of the marlin is dried, smoked or used as poki. We will keep one every now and then upon request. But it really is too much meat to deal with and not the best eating fish. What if we just want to catch anything or just get some action? When people just want to catch lots of fish the smaller Yellow Fin Tuna and Skipjack Tuna are great way to get action on light tackle. Plus, the yellow fins are great to eat. If the smaller schooling tuna are not around then sometimes we will drop bait or a jig to the bottom and catch Amberjack or Trevally. One has to remember…it’s called “fishing” not “catching”. We usually can catch something but every now and then it doesn’t happen. 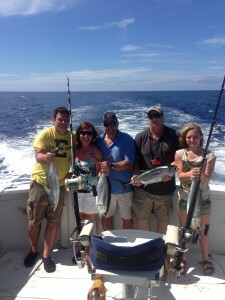 We just want to catch something to eat such as Mahi Mahi, Ono and Tuna? In the spring and summer months you can really target the Ono by trolling lures in 50 fathoms of water but also catch in the deep around floating debris. The Mahi Mahi you can catch trolling in the deep or “Ono Lane” but can really catch them good around the FAD’s or floating debris when the conditions are right. The big tuna can also be caught trolling but its best to find a porpoise school and use the green stick or live bait. The green stick is the large center pole on the “Hooked Up”. Can we buy live bait like in Mexico or Florida? No you cannot buy live bait in Kona. We catch our own bait when we can. One has to remember we are in the middle of the Pacific Ocean and do not have the reef systems or the structure that holds the bait like the mainland. Lot of the times during the year we will try and catch our own Mackerel or smaller tuna and use them for live bait when we have the opportunity. Usually between 15-20%, all tips are split between the captain and his crew. Can we keep are catch? Yes, the crew will fillet your fish for you. Usually most customers take enough fish to enjoy on their vacation. If you don’t want the fish or there is more than you will eat the crew will sell the fish for extra income. Hawaii is one of the only states where charter boats can sell their catch. What if we have nowhere to cook our fish? You can take your fillets down to Captain Chuck and Jim’s parents’ restaurant “Pancho and Lefty’s” located on Alii’ Drive… they will be happy to cook your catch for you and you will receive 20% off your fish entree’. Is there any packaging and shipping facilities for us to freeze and ship our fish?